Enya (born 17 May 1961), birth name Eithne Ní Bhraonáin (sometimes presented in the media as the Anglicized Enya Brennan), is Ireland's best-selling solo musician. As a musical group, Enya is really three people: Enya herself, who composes and performs the music; Nicky Ryan, who produces the albums; and Roma Ryan, who writes the lyrics in various languages. Enya is a phonetic approximation of how Eithne is pronounced in her native Irish. Writing every song, for me, is a little journey... It's everything. It's the walk you take in the morning, it's the night before, the meeting with people, landscapes, the chats, all of that evolves in some way into melody, but I'm not sure how it's going to happen. I'm dealing with the unknown all the time and that is exciting. I think they find it — they find me quite confusing, because — they know the music, but they don't know anything about me ... because I keep a very private lifestyle so they end up ... making up stories as such. But I don't really concern myself too much about them. On the project The Celts I was asked to ... to write a song. And, at the time I was ... arranging with Nicky, and writing the music and performing ... so, no desire whatsoever to write lyrics!... But Roma was actually writing poetry at the time, and she was involved, with listening in the studio ... being the audience in the studio ... so she was involved with the project. So, it was very obvious that she would write the lyrics. There is no set sort of rules, or no set sort of formula to the way we work in the studio ... so it's difficult to know ... what we'll move on to next. We don't like to say, "Never, no we'd never do this" ... But, we ... like the setup as far as there's only three people in the studio ... because the work is very personal, very intimate, very emotional ... and that is very important to the album. I get very inspired by traveling, by being home in Donegal ... all those wonderful moments I'll take with me to the studio. And they, ah, then become at some stage, a melody. That emotion that I loved at some stage will evolve as a melody. For me, I've derived from religion ... what... I enjoy ... and it's to go to church, but usually ... when there's nobody else there. I just love that moment, ah, to just sit there. It's very peaceful, very calm, and very therapeutic, and it's ... wonderful. A lot of people tend to think that because I need all this time on my own in the studio, that I need time on my own, period. And that's not really true. I get very inspired by traveling, by being home in Donegal ... all those wonderful moments I'll take with me to the studio. And they ... then become at some stage, a melody. That emotion that I loved at some stage will evolve as a melody. Regardless of how I live my life, there are people who develop fixations that are not healthy. It could be a visual thing, or it could be the music that they are drawn to. These people need help. I do promotion when it is necessary ... But I always want to get back to the music. The personal appearances and red carpet events are very glitzy, but it's a bit false. I'm not one for walking the beaches humming a melody ... I love the discipline of sitting in the studio, writing and listening. That is my domain. They are as much "Enya" as I am. On her producer Nicky Ryan and her lyricist, his wife Roma Ryan. There is no formula to it because writing every song, for me, is a little journey. The first note has to lift you and make you go, 'What's this?' You play C, but why is it that one day it leads to G and it didn't yesterday? I don't know. It's everything. It's the walk you take in the morning, it's the night before, the meeting with people, landscapes, the chats, all of that evolves in some way into melody, but I'm not sure how it's going to happen. I'm dealing with the unknown all the time and that is exciting. I suppose there's a certain way I like the music to be performed, and I feel I can capture it better than anyone else. I know every note in every song, the whole history of it, even parts that were there and are gone. The word workaholic is so severe, but I do focus a lot on my work ... I think a lot about what I'm doing in all aspects of my life, what am I trying to achieve here, am I happy with this? Music is like a mirror in front of you. You're exposing everything, but surely that's better than suppressing. ... You have to dig deep and that can be hard for anybody, no matter what profession. I feel that I need to actually push myself to the limit to feel happy with the end result. "A Rare Meeting With Enya" interview with Henna Helne (24 November 2005) translated from Finnish by Suvi Kaikkonen. Many childless single woman would be at my age already in panic. Also I have been thinking for the last 3 years, why I have been sacrificing so much time for my work. But, I have ended up to a thought that I would never change a single day out of my life. It would be lovely to get a family one day, but my life doesn't end even if that would not happen. I and Nicky have got a lot of disagreements, but they are nearly always associated to music. Because we both are very strong-willing persons, we might sit in the opposite corners in the studio argueing about things. One does never know beforehand, whose idea works the best way. Amarantine is an ancient word, which means eternity. The poets describe an undying flower with that word, and I fell in love with that idea ... For me that word suited rhythmically to the refrain of the piece. A-ma-ran-ti-ne. In our website the fans tried to guess something super-romantic to be the album's name, but this word was obviously never guessed by anyone. For me this career and that I am privileged to do a job I love to do, means really, really much. I would never change any moment from my life. When making music I sink myself into the process as deeply as I can and forget all of the success. I could have been more famous if I did all the glitzy things, but celebrity always seemed so unnecessary ... Fame and success are very different things, anyway. The music sold itself before anybody knew who I was, so I felt I had a choice. I told the record company I didn't feel the need to be out there at red-carpet events. I wanted a career. But I wanted to keep myself intact as a person. I started writing instrumentals but Roma pointed out they were very visual, so she started writing lyrics .. and Nicky had this idea of creating a wall of sound and started multi-tracking my voice. I didn't expect such a huge reaction, but I knew I was doing something different to everything else that was happening at the time ... People feel a very personal connection with the music. There might be one little thing that makes all the difference, one note or one word. The fine-tuning is all important, and you've got to stay there until you get it right ... That's why it can take years. I am really a very shy person ... If I appear, it is because of the music, not because I want to be seen. I'm not a recluse. I like to go out, but I don't like the glitziness that goes with it. I'm very happy as I am. I realise that I made sacrifices early in my career and that it was hard on my relationships because, when I am working, I am very focused and it isn't easy, when you have been in the studio all day, to say to someone, 'I'll meet up with you later on.' I learned that it was necessary to be dedicated and put work first. But, at the same time, it was a wonderful feeling to be successful at doing something I loved. When I left school, I had a list of priorities headed by 'marriage' and 'children'. That is how, I suppose, as a woman, you are brought up to think. At the same time, as I grew older, I told myself that if it happens, it happens, and that will be fine, but if it doesn't, that will be fine, too. I loved to talk about music to Nicky ... His influence came from people like The Beatles and The Beach Boys, and he had these ideas about layering vocals, painting landscapes with music. Roma knew about Irish mythology, told stories, wrote poetry and had this special feeling for lyrics. My grounding came from the classics. Sitting and writing music on your own makes you think a lot about your life. Who are you? Would you change anything about yourself? This is where it comes from. It is like having a mirror held up in front of you, looking into yourself and asking these questions. What I was looking for was a romantic athmosphere that I could feel at home with. I think I've achieved that. I love my home. I have friends round. I take care to live in it, not to work in it. I'm sometimes asked what are the pluses and minuses of celebrity ... and, for me, the biggest plus is being successful at something that I love to do. The minuses, unfortunately, include having to live with security and the knowledge that you may be stalked. ... I do like people ... I have lots of friends, but I can only be who I am. I live in Victorian Gothic castle in Killiney that I was so bold as to rename Manderley, because Daphne du Maurier 's Rebecca is one of my favourite books. 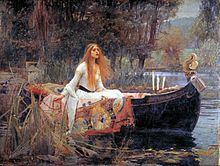 ... People have this image of me as an ethereal Lady of Shalott, floating across the battlements, but it's a very small castle as castles go — with no big ballrooms... I don't write my music in my home, only in the studio; I want as normal life as possible at home, with dinner parties and entertaining. The success of Watermark surprised me. I never thought of music as something commercial; it was something very personal to me... The writing of a melody is an emotional moment; success doesn't make it easy. I felt as if we were two families: the older ones, who were away touring when I was at school and the younger ones. I was closer to my two younger sisters because of the nearness of our ages, but I feel I would have to have permission to say their names — they're very private that way. I joined my family's band, Clannad , as a teenager in 1980 to sing harmonies and play keyboards, but it wasn't musically challenging for me; I felt like an outsider. ... My split from Clannad two years later caused a conflict of loyalty for a time, because I went off with their manager Nicky Ryan, who had asked me to join Clannad in the first place. I have never come close to being married or engaged. I was with someone eight years ago when I questioned whether I wanted the pressure of being married or having children. I always felt that if pregnancy was to happen, it would happen; if it didn't, it didn't. ... I have security, I don't need a man in my life. I don't have pets, I have two guard dogs; and I don't do my own shopping; it's a security thing....The downside of success is stalkers. I have had death threats from people with fixations who need help. Note: Though all vocals and instrumentals on her albums are done entirely by Enya, nearly all the lyrics to her music are written by Roma Ryan, or taken from traditional sources. Saol na saol, tús go deireadh. Tá muid beo go deo. English translation: Life of lives, beginning to the end. We are alive forever. "The Celts", from The Celts (1987) Translations for The Celts, from Enya: Translations and Lyrics. English translation by Fidelma McGinn, Daniel Quinlan, and Willie Arbuckle. And my path, the ocean. As I sail home to you. From within me calls — could it be I am sleeping? For a moment I stray, then it holds me completely. Close to home, I cannot say. Was what was destined to be, bye bye. The day is long past. but only where you go. and where the stories go. Out of night, our small earth. to find those who will listen. we are a lost island in the shadows. to let your heart believe it's true. You feel it in the heartbeat of the day. You know this is the way love is. — how far a heart can fly away! for night and day belong to love. Where are you this moment? now you're so far away. Our words go beyond the moon. Our words go into the shadows. The river sings the endlessness. We write of our journey through night. We write in our aloneness. We want to know the shape of eternity. Who knows the way it is? Who knows what time will not tell us? Why did we fall into days? Why are we calling out into the endlessness? to the heart that's coming home? but you don't know why. all I've said, all I say to you. all your love to me. Enya left school in 1979, and we had already been a nucleus, so it was probably difficult for her. She wanted to go off and do her own thing. Tensions were created because we never answered any of the questions. If you're going to answer questions, people aren't going to believe you anyway. The proof of the pudding is that Enya is my sister, and I love her dearly, and we get on really, really well. She does have a life. She'd kill me if I talked about it, so I'm not going to talk about it. There's a difference between being a private person and a recluse. All this blushed and flushed stuff about her being a recluse put it to bed, for God's sake. Enya never writes a bad melody. That's first and foremost her secret. As she goes along, she'll start changing the dynamics, pushing here and there so that not everything is perfectly in unison. It adds a texture you can acquire only from having different voices. The variations lead to interesting quirks. It's an integral part of the Enya sound. Enya knew nothing about recording, about production or arrangements. Originally, we were stock-piling music and just letting her get on with it. There was no name on the music she was writing. All I knew was that hard work succeeded. I heard the soundtrack to The Celts TV programme, which Enya had done, and I thought "what's this magical music? ", and it was such an antidote to the, sort of, the day's work, that every night I went home and played the soundtrack from The Celts. And then I met her in Ireland and she was telling me how she was signing to another record company, I went "no, no, no, no, you can't do this, you must sign with us." And I did it really just as a self-indulgence, that I thought this was beautiful music and wanted to be associated with it, there wasn't really a kind of commercial edge to it at all. Sometimes the company is there to make money, sometimes it's there to make music. Enya was the latter. I would have been a genius if I knew this was going to sell millions of records. I just wanted to be involved with this music. Enya and her team record and we stay in touch until there is something for me to listen to. I then provide an outside view. She is a genius in the studio, comparable to somebody like Brian Wilson, but she and Nicky can be their own worst enemies at striving for personal best all the time. I guess that's the price of perfectionism. There's something about Celtic mythology which is deep in the soul, and I just think that somehow she has tapped right into it. You tend to behave yourself in her company. Make even a small joke about her songs and she gets angry. And she does have a peculiar effect on men. I've watched normally sane journalists waxing metaphysical when they meet her. Playing in a family band has many advantages, but it can often mean that when the going gets tough you take it out on each other with a liberty that only family can tolerate. I suppose it had always been difficult for Eithne. We loved what she brought to the band, but I know it was hard for her to infiltrate our years as a tightly knit nucleus. Musically, Ciaran and Pol had always been the creative force, and Noel, Padraig and myself had then worked our own expression around them. It was a good formula that worked well. Inevitably, when Eithne joined us full time, she found it hard. She hadn't been part of the original song-collecting days and consequently didn't share our enthusiasm for the old songs. I suppose she always felt little more than a "guest musician". As sisters we had always been close and talked about everything together, so I was sorry when band business caused a strain between us. One day, just after the tour, Eithne announced that she had decided to leave Clannad. She was going to pursue a solo career with Nicky Ryan as her manager. In the long term it turned out to be a good decision. I missed her, but I'm sure the apprenticeship with Clannad helped Eithne develop her own sound and afforded her strong contacts in the music business. She is talented and ambitious and, in the years that followed, the family was delighted to watch the success that came her way. Over the years I have learnt to be on my guard but, as any artist will testify, you are completely powerless if a writer has a certain agenda. There have been many damaging articles that have hurt my family deeply stories about our relationships, particularly between myself and Enya. We resolved in the early days not to talk about our private lives but, especially in Enya's case, this has often led to more intrigue and false speculation. For an artist, it is the unfortunate consequence of being in the public eye, but what makes me really angry is the way the family inevitably bears the suffering. Eithne had been working on her album and the single, 'Orinoco Flow', was released while we were in the studio. We were so excited for her. It was already at number eleven in the charts and we felt sure it was going to go up. We'd watched her on Top of the Pops the week before, so come Sunday evening we expectantly gathered in the house near the studio to listen to the Top Forty. Our youngest brother, Bartley, was working in London and he came over to be with us to hear the news. Number one! We were all shouting and screaming and hugging each other and you couldn't have heard the record playing above the din in the room. First we spoke to Eithne on the phone. More squealing. She was so happy and we knew that sharing the moment with us, even over the telephone, was very special. Then we rang our brother Leon who was over in Donegal. He'd been driving Mammy to church and they'd been frantically trying to get the radio station on the car radio so they could hear the result. The whole family were over the moon. That evening at dinner we had a bottle of champagne and toasted Eithne's success. On Christmas Day the traditional Brennan Christmas continued in full swing. It was wonderful that we could all be at home together. The girls set about preparing the meal while the boys rearranged the furniture so we could all sit around the table together. Eithne had just got a video camera and was skulking from room to room trying to catch everyone at their most embarrassing. It didn't take much to get us to act accordingly and the house was full of laughter and song. This page was last edited on 20 March 2019, at 21:17.